Cestrum parqui is a shrub of the Solanaceae family that is a toxic plant and has become an invasive weed. It prefers moist habitats but is commonly found along roadsides, and neglected, disturbed, and abandoned sites. This species exhibits vigorous growth and out competes most native vegetation. With its extensive, shallow root system C. parqui is extremely difficult to eradicate, however there are various control methods available. C. parqui is toxic and is responsible for the death livestock around the world annually. It is just as dangerous to humans. QDNRM (2005) states that, \"Cestrum parqui is an erect, perennial shrub to 3m high, with one or more stems emerging from each crown. The young stems are whitish; older stems are darker, striated at the base and mottled above. The leaves are alternate, up to 12cm long and 2.5cm wide, and have an unpleasant odor when crushed. The greenish-yellow flowers are in clusters at the ends of branches. The flower tubes are up to 2.5cm long with five small terminal lobes. They have an unpleasant odor by day (similar to urine), but are fragrant at night. The fruit is a purplish-black, oval berry about 1cm long. The dark purple pulp contains one or two seeds of 3 to 4mm length, which have an irregular shape with sharp angles.\"
PIER (2005) details C. Parqui more descriptive characteristics as follows: \"A shrub, generally 1-3m high. Petiole to 1cm long. Lamina 2-12-(14) X 0.5-3cm, lanceolate to narrow-ovate, minutely puberulent when young, otherwise glabrous; base attenuate or cuneate; apex acute to short-acuminate. Inflorescence paniculate, dense; branches more or less puberulent; flowers subsessile or with pedicels to 7mm long, fragrant nocturnally. Calyx 3-6mm long; lobes 1mm long, more or less triangular, obtuse to subacute; margins shortly villous. Corolla 1.5-2.3cm long, greenish yellow or pale brownish yellow; tube narrow-salverform, widening slightly above; lobes 3.5-6mm long, narrow-triangular, patent, shortly villous inside and on margins, acute or short-acuminate. Fruit 7-10 X 6-8mm, broad-ovoid to broad-ellipsoid, glossy, black or purplish black (Webb et al. 1988, in PIER, 2005).\"
McLennan and Kelly (1984) report that, \"C. parqui poisoning is characterised by ataxia, depression, recumbency, convulsions and death. In controlled studies Calves have died within 48h of consuming just 30 g of plant/kg bodyweight. Doses of 11 and 17 g/kg caused only mild intoxication, with dullness and anorexia lasting 2 days. In natural and experimental cases the main lesion was hepatic periacinar necrosis. C. parqui poisoning in cattle is a primary hepatotoxicity.\" \"Two alkaloids, parquine and solasonine, have been isolated from C. parqui and it is thought that these substances could be responsible for its toxic effects.. Time of death varies from mere hours to 3 days after consumption of the plant, and depends on the animal, time of year and amount of C. parqui eaten\" (QDNRM, 2005). QDNRM (2005) states that, \"Cestrum parqui germinate in autumn. Plants flower after two years and produce flowers for several months through summer and autumn. The plants are long-lived, producing new growth in spring. Seeds remain dormant in the soil for many years.\"
The Sydney Olympic Park Authority (2004) states that, \"C. parqui is not particular about where it grows. It has been found in alluvial river flats, riverbanks, and remnant bushland on both shale and sandstone soils, anywhere with warm temperatures and high rainfall, like its subtropical home in Peru and Chile.\" Croft and Holding (2004) report that, \"In its introduced range C. parqui has been observed invading moist habitats along drainage lines such as creek banks and wetland edges, and in disturbed edges of bushland pockets where thickets dominate, and growth and regeneration by native species is prevented.\" QDNRM (2005) reports that C. parqui is found along roadsides, and neglected and abandoned sites. The Sydney Olympic Park Authority (2004) states that, \"During summer and autumn, C. parqui produces clusters of shiny black berries with finger staining dark purple pulp containing several wrinkled seeds. Birds love both the flower nectar and berries, and spread the seeds in their droppings. Seeds usually germinate in autumn but can remain dormant for years. Within two years, young plants can also produce flowers and berries. The roots also produce new plants from suckers.\"
Cestrum parqui was/is promoted as suitable for gardens in 19th century in Australia (Sydney Olympic Park Authority, 2004). Cestrum parqui is said to have been brought direct to the Puhinui district in New Zealand by an Aucklander visiting Chile (Esler and Sandra, 1987). 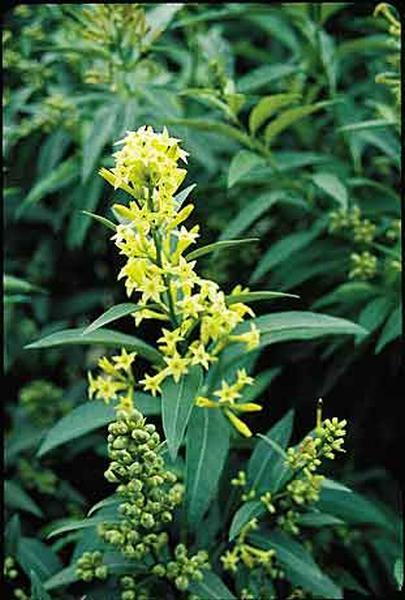 Recommended citation: Global Invasive Species Database (2019) Species profile: Cestrum parqui. Downloaded from http://193.206.192.138/gisd/species.php?sc=850 on 26-04-2019. The Sydney Olympic Park Authority (2004) states that, \"Because it is so adaptable to Australian conditions, C. parqui competes strongly with bush and pasture for living space. Cattle and dairy farmers don't like cestrum at all because when green feed is short, animals eat it and die a quick and painful death. It can also be toxic to other animals, even humans. Because of its vigorous regrowth and seed lifespan, C. parqui is extremely difficult to control. It can be cut down, dug out or pushed out but follow up work is essential to prevent regrowth. Herbicides are effective, but care has to be taken not to contaminate watercourses, or allow spray to reach desirable plants.\"
QDNRM (2005) states that, \"C. parqui grows vigorously if neglected. On alluvial flats it has been known to outcompete most other vegetation. This species needs careful control because its extensive, shallow rooty system can produce many new plants from suckers, particularly after root disturbance or injury. C. parqui is toxic to animals including cattle, sheep, horses, pigs and poultry. Its effect on native fauna is unknown. Symptoms in cattle include fever, loss of appetite, increased thirst and eventually, general paralysis. Poultry develop acute kidney and liver damage. Post-mortem examination of poisoned animals usually reveals extensive internal haemorrhaging.\" Croft and Holding (2004) state that, \"The presence of this plant on many properties and in backyards means that there is the potential for children to gain access to plant material, especially seeds.\"
Preventative measures: QDNRM (2005) suggests that, \"Newly established plants should be destroyed before they flower and produce berries. Birds eat the berries, dispersing the seed to new areas. Do not plant green cestrum in gardens, as this acts as a potential point of dispersion. Roadside infestations should be controlled before road grading is carried out. The same recommendation applies in cultivation areas; control the cestrum first. Land which is overgrazed, and therefore has limited plant competition, should be regularly checked for new infestations.\"
A Risk assessment of Cestrum parqui for Australia was prepared by Pacific Island Ecosystems at Risk (PIER) using the Australian risk assessment system (Pheloung, 1995). The result is a score of 11 and a recommendation of: reject the plant for import (Australia) or species likely to be of high risk (Pacific). Mechanical: Croft and Holding (2004) state that, \"Mechanical control involves digging up plants by hand and removing all plant material including roots. Due to cestrum's ability to sucker from root fragments, follow up control is often required. Control using an application of mulch to cover and suppress seedling growth has been used. This method retains moisture in the soil and provides protection for native plants sown in conjunction with the mulching operation. It is used following chemical or mechanical control.\"
Chemical: Croft and Holding (2004) state that, \"Chemical control involves spot-spray application of herbicides and is used in heavy infestations to knock down mature stands. Alternatively a basal bark application with a dropper bottle can be used on isolated plants. Timing of treatment is important and should be done prior to setting seed. Suckering and seedling growth may occur so follow up treatment will be required.\"
QDNRM (2005) has listed a variety of chemicals used to control C. parqui in a variety of ways. Picloram & triclopyr (Grazon DSR) can be applied late spring to early autumn and to thoroughly cover all leaves and stems. Trichlopyr (Garlon 600R) can be applied if foliage is thoroughly sprayed when C. parqui growth is very active. Amitrole (Amitrole TR) can be used just prior to flowering and applications can be repeated if necessary until sufficient control is achieved. 2,4-D & picloram (Tordon 75-DR) can be used in spot treatment applications. And finally, Picloram & triclopyr-AccessR can be applied as a basal bark or cut stump application (QDNRM, 2005). Biological: QDNRM (2005) states that, \"C. parqui seedlings can be suppressed by vigorous competition from other plants. Control adult plants, then plant a vigorous pasture species or local native species, which will compete with seedlings. This method is not always practical on riverbanks and gravel beds. This species can be killed by digging out the plants completely. Care must be taken to remove all the yellow roots, otherwise regrowth will occur. It is preferable to burn the roots.\"
Informations on Cestrum parqui has been recorded for the following locations. Click on the name for additional informations. Croft, D., and Di Holding. 2004. A community approach: Green cestrum factsheet . Cooperative Research Center for Australian Weed Management. Csurhes S., and R. Edwards, 1998. Appendix C (continued): Potential environmental weed species that have histories as weeds overseas but are too widespread to, be eradicated from Australia (continued). Queensland Department of Natural Resources. Eurobodalla Shire Council. 2004. Green cestrum (Cestrum parqui). QDNRM (Queensland Department of Natural Resources and Mines). 2005. Green cestrum: Cestrum parqui. Document/Fact Sheet PP15. Sydney Olympic Park Authority. 2004. Green Cestrum (Cestrum parqui). Bunn. K. 2004. Weeds of Hunter and Central Coast. Weeds of the Riparian Zone of Australia. McLennan, M. W., and W. R. Kelly. 1984. Cestrum parqui (green cestrum) poisoning in cattle. Aust Vet J. 1984 Sep;61(9):289-91. O Hara, S. A. Undated. Cestrum L. Solanace� (Nightshade Family) Mediterranean Garden Society. Sanz-Elorza, M., Dana, E.D. & Sobrino, E. 2001. Aproximaci�n al listado de plantas al�ctonas invasoras reales y potenciales en Espa�a. Lazaroa 22: 121-131. The Unwanted Citizens : Plant Invaders in Spain. USDA-GRIN (Germplasm Resources Information Network). 2005. Cestrum parqui. National Genetic Resources Program [Online Database] National Germplasm Resources Laboratory, Beltsville, Maryland. USDA-NRCS (Natural Resource Conservation Service). 2005. Cestrum parqui. The PLANTS Database Version 3.5 [Online Database] National Plant Data Center, Baton Rouge, LA. World Wildlife Fund. 2004. 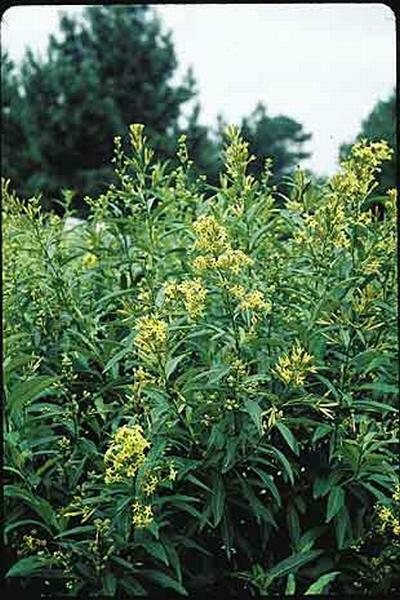 National list of naturalized invasive and potentially invasive garden plants. WWF Australia.